People with tattoos are rebels. 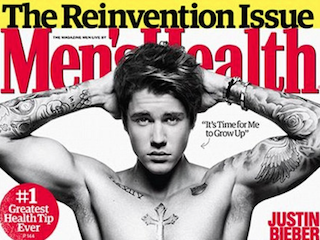 Justin Bieber is Men’s Health’s latest cover star. Here he is in a completely not-photoshopped pose. We can’t think of a more fitting cover star for Men’s Health than a 21-year-old brat who is beloved by seventh grade girls and produces awful music. What a great choice.